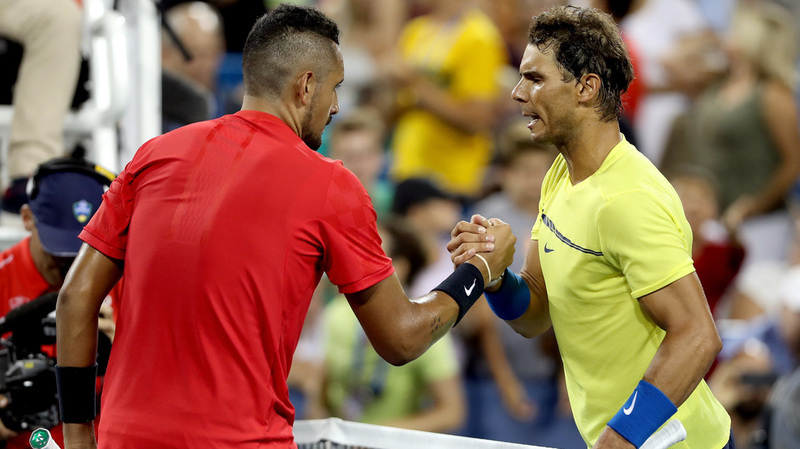 Rafael Nadal and Nick Kyrgios came through blockbuster semifinal clashes on Saturday - Nadal over Grigor Dimitrov, Kyrgios over Alexander Zverev - to set up an all-star final at the China Open. 2. Nadal’s going for his 75th ATP World Tour title. He’d become just the fifth man in the Open Era to reach 75 after Jimmy Connors (109), Ivan Lendl (94), Roger Federer (93) and John McEnroe (77). 3. Kyrgios is going for the equal-biggest title of his career. He’s won one ATP World Tour 500-level title before, at Tokyo last year - in fact if he wins in Beijing he’ll become just the fourth player to have completed the 500-level Tokyo-Beijing double, after Nadal, Andy Murray and Tomas Berdych. 5. But since then, Nadal’s also become the first player to 60 wins this year. Like he’s done time and time again this year, Nadal battled his way to victory against Pouille, and his semifinal win over Dimitrov was his 60th match win of the year. He’s nine wins ahead of next-most, Zverev, who has 51. 6. Nadal’s also going for a tour-leading sixth title of the year. The World No.1 has won five ATP World Tour titles this year at Monte Carlo, Barcelona, Madrid, Roland Garros and the US Open, which ties him with Federer and Zverev for most titles so far this year. Will he take the lead in Beijing? 7. Kyrgios has beaten a World No.1 before. And it was Nadal in the fourth round of Wimbledon in 2014 - just 19 at the time, Kyrgios became the first teenager to beat a World No.1 at a major since the semifinals of the French Open in 2005 (when a 19-year-old Nadal beat then-World No.1 Federer). 8. They’ve both got winning records in finals. Nadal is playing his 110th career final (with a 74-35 record in his first 109) while Kyrgios is playing his sixth career final (with a 3-2 record in his first five).